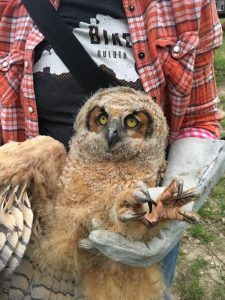 It all started with a phone call from my husband, Wes, who was on his way to work, “There’s an injured owl that just drug himself across the busy Troost Avenue,” that led me racing to find him. Just before turning onto 77th street, I saw the poor guy. He was crouched in the grass, just sitting. The owl was clearly alert and aware of his situation, but also clearly could not fly. I spent an hour and a half, eye to eye with him in the grass, calling anyone I could think of that could help. I got absolutely nowhere. Many wildlife rehab centers are evidently closed on Mondays. So many veterinarians don’t work with wildlife. Animal Control in Kansas City turned me and my new friend away, too. I even called Oak Park High School, wondering if maybe, just maybe, one of the teachers had experience helping injured wildlife. 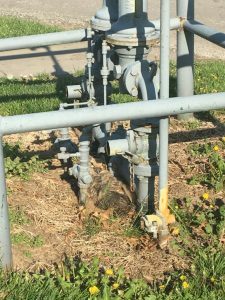 The owl hiding under the pipes. My husband and I are huge animal lovers. Seeing no help in sight, my heart was breaking and I began losing faith. As a last ditch effort, I thought maybe I’ll post in the Bridge Pointe’s private Facebook group. In my experience, our awesome neighbors always answer posts quickly, so I knew it was worth a shot. Within minutes, someone I don’t know, but who I am so thankful for, Elissa Nadelback Taibi, commented. She said that Gladstone Animal Clinic WOULD take him. Doubtful, I called anyway. Immediately the receptionist put me on the phone with the vet, Andrew Rambo, who took charge as soon as he answered. He asked about 30 questions, asking me to describe the owl’s feather type, color, approximate size, shape of head, and eye color, so he could determine exactly what we had on our hands. The answer: A Great Horned Owl. Without hesitation, Andrew was adamant about the extreme risk of trying to pick up this owl. He said the Great Horned Owl is ferocious. Once again I felt like the efforts to save this poor animal weren’t going to work out. I wanted to help, but the risk of getting clawed alive was too real. Then again, when I was about to lose faith again, Steve Bingham, another saint of a neighbor, came to the rescue. I didn’t know him, even though he lives on the same street as me (NE 82nd Terr). Soon we were texting one another, within 15 minutes we were with the owl, gloves on, blanket in hand, box ready. Steve made it look super easy, he covered the owl’s face with the blanket to “blind” him. Keeping our eyes on his gigantic talons, Steve scooped him up and I slid the box under him. We closed the lid–mission accomplished. Gladstone Animal Clinic assessed our new owl friend. Steve and I were able to see him up close, and more safely, while Dr. Andrew Rambo used thick gloves to hold him tightly by the legs. We took a picture.The owl’s injured leg would be X-rayed. 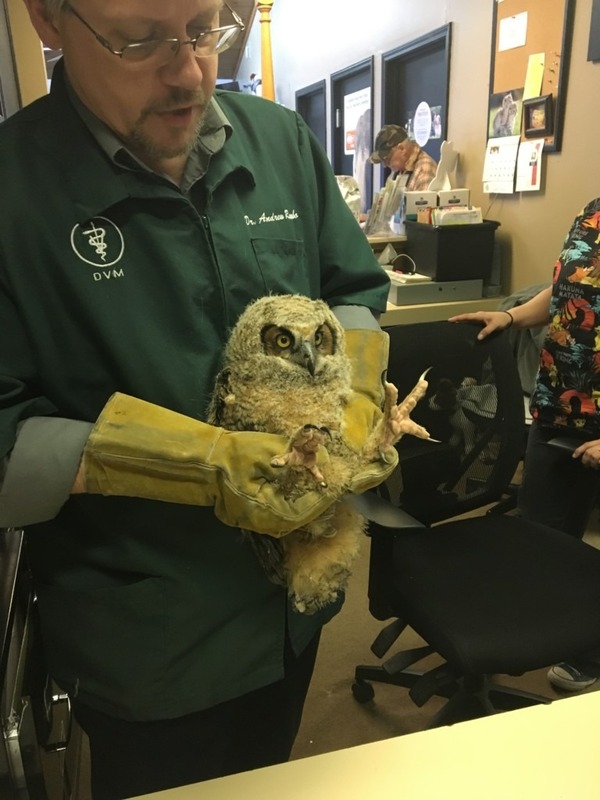 Ultimately he would be transferred to Lakeside Wildlife Rehabilitation Center. He’d be given time for healing, and then would be released back where we found the him. Steve and I had to fill out some paperwork, describing exactly where we found the owl. Then we left, thankful to have come together in such a great way! The X-rays came back normal, so the guess is that the owl either left, or fell out of his nest too soon. His flight feathers didn’t appear to have grown completely, so he can’t fly yet. After his feathers finish growing as Lakeside, he’ll be released back to where we found him. Thank heavens for the powers of Facebook, and for awesome neighbors! 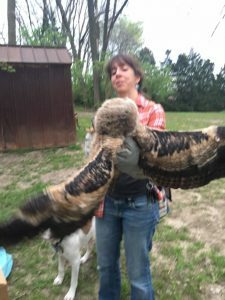 Between Steve and I, (and my awesome husband, who saw this poor owl in the first place) – this Great Horned Owl is going to be just fine! It all came full circle! Ruth was an incredibly smart and wise lady, not to mention so friendly and warm! We walked the field by where my husband first saw our owl, and Ruth spotted his parents flying nearby. Come to find out, his parents and his sibling! Live in a wooded area right in someone’s backyard less than a block from where we found him. The owner of the property, Chuck! Let us come over and after explaining everything to him, he informed us that the owls sibling was “playing” in his backyard right now….when we rounded the house, there he or she was – literally running around on the ground, like a little kid!! Oh and the property owner had dogs who didn’t care at all about any of the owls! Chuck said they were used to them!! The owls parents were right above us, keeping an eye on everything!! AHHHH so amazing!! We got to see our owl one more time, and actually pet him!!! And then he was released!